Black and white negative showing a team photograph of the Brooklin Redmen Senior A lacrosse team. 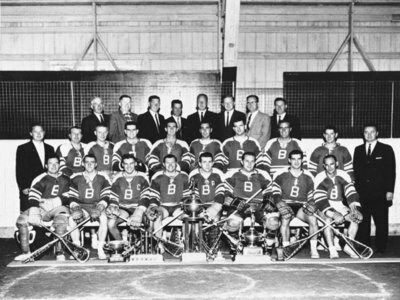 In 1963, they were Ontario Lacrosse Association Senior A league champions. Back row: Bill Vipond, Cliff Gordon, Bob Vesey, Rocket Richardson, Walt Haynes, unidentified, unidentified, Art Morton. Front row: Ted Higgins, Cy Coombs, Glen Lotton, Larry Ferguson, Don Craggs, Pat Baker, Don Bruce, Rock Batley. Brooklin Redmen, 1963, unknown photographer, Whitby Archives, 21-016-015.